Are you a climate data user? If you are a user of climate data, you're a potential stakeholder in this project. This project is developing commentary metadata to enhance the usability of climate data sets to users. There are many different types of climate data, encompassing in situ and remotely-sensed observations, the results of numerical models and the combination of models and observations in re-analysis programmes. To be able to issue a simple statement about a products qualitative and quantitative "quality", the user requires easy access to detailed and comprehensive supporting information about the datasets. 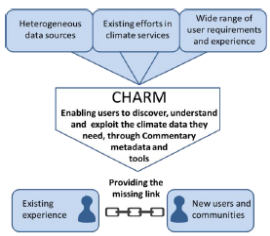 The picture below ilustrates the core concept of this project, which is to ensure that climate data is usable to a wide interdisciplinary user community by providing users access to information they require to judge whether a dataset is fit for purpose. Click here to go to the about page. The first consultation meeting was held on the 14th of March 2013. The relevant outputs from this meeting will be available in report form very soon. The purpose of this was to discuss user requirements to assist in the development of the CHARMe system. Here are the project milestones when releases to the stakeholders will take place. Report on technical best practice and recommendations for standards that should be employed on project.